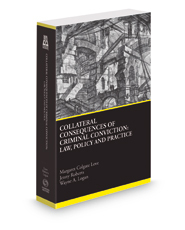 Home > Law Books > Treatises > Collateral Consequences of Criminal Conviction: Law, Policy and Practice, 2018-2019 ed. This book covers general types of collateral consequences, attorney's duties regarding consequences, constitutional challenges to consequences,access to and the use of criminal records, regulation of employment and occupational licensing, and restoration of rights after a conviction. Insights on practice guidance, historical background and future trends are discussed.